We have an op-Ed in the LA Times on the 40 years of federal hostility to unorthodox political voices, corrected by the Citizens United case. Be careful, the piece has lots of unorthodox material and may influence your binary view of American politics. And on May 30, Dianne Rehm will interview Glenn on her show! Buy the book at Amazon or BarnesandNoble.com. The big day is finally here: BALANCE is available wherever books are sold. And its on discount pretty heavily at Amazon and Barnes & Noble to spark sales. Of course, we are excited, but the biggest part of the excitement is the opportunity we will have to finally have a conversation with readers. On that point, if you have ANY comments or questions and want to engage in a dialogue, write them here. I look forward to reading what you think. Did we choose the right seven (eight if you count California) case studies? My favorite chapter may well be the one about Britain, especially our offhand comment that it never really declined, but we knew that its exclusion would be met by howls. So, fine, there it is. The IRS actions – from targeting conservative tax-exempt organization to lying to members of Congress – were outrageous. … An increasingly polarized Washington is devouring its own. Ceaseless, take-no-prisoners political warfare, not nefarious White House plots, ravages government. We are in the midst of the worst Washington scandal since Watergate. … The IRS case deserves and calls out for an independent counsel, fully armed with all that position’s powers. Only then will stables that badly need to be cleaned, be cleaned. Everyone involved in this abuse of power should pay a price, because if they don’t, the politicization of the IRS will continue—forever. If it is not stopped now, it will never stop. And if it isn’t stopped, no one will ever respect or have even minimal faith in the revenue-gathering arm of the U.S. government again. Of course, I am deeply disturbed by the IRS scandal. 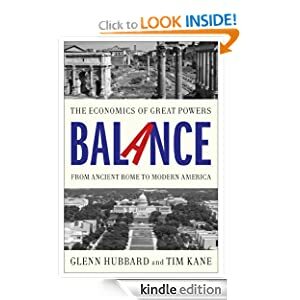 Glenn and I are working on some op-eds to coincide with the launch that will go into more detail, not to mention the remedies we discuss in the final two chapters of BALANCE, and we are eager to talk about the real root of America’s political dysfunction in the weeks and months ahead. As a White House chief of staff once said, we shouldn’t let a crisis go to waste. Good can come of this. A warning: Even if there are some bad Democratic apples, this scandal is more complicated than a left-right battle, no matter how criminal the actions may be. Let’s keep our eye on the nonpartisan, structural causes of political polarization. Doubts are growing about whether China can pass the US to become the world’s biggest economy this century amid warnings that the country’s 30-year miracle is nearing exhaustion. … As of last year US GDP was roughly $15.7 trillion, compared to $8 trillion for China on a nominal exchange rate basis, the measure that matters for gauging economic power. An emerging great power opens up to the world (China, capital). Nice essay by Ezra Klenn. Meanwhile another builds walls (America, migration). What a week! It helps answer one of the great questions for the future of the world. Namely, what sort of economic power will China be? Will it remain an inwardly focused nation concerned only with attaining rising incomes for its own population? Or will it become a major force in international finance, with Shanghai one day emerging as a financial center on par with New York or London? I get more messages than I ever expected after publishing Bleeding Talent, and I got permission from “Kandace” to post hers below. The question: should she join the Air Force? My answer follows. I happened upon your recent Palantir Night Live talk about the personnel issues in the military. The talk resonated with me because I’m facing a decision right now about continuing my recruiting process with the Air Force. I want to defend my country and protect national security. The military sounded, to the college version of me, like the best way to do that – especially after sequestration locked down hiring at many of the three-letter agencies. 1. At the officer recruiting talk at a local university, the recruiter only talked about money – how much we would make, how much we would save, what a fancy car he could drive, the marble countertops in his house, how he could buy steaks at the grocery store for $7.50. That was the whole pitch. For a lot of top performers who might enter the military, I think that money is only a small part of the picture. The recruiter wouldn’t directly answer questions about how jobs were chosen once a person entered the military, or why his boss, a top-notch fire rescue strategist, has to spend two years doing human resources before he can get promoted. In fact, he didn’t seem to understand why that even mattered to anyone. 2. I told my high school physics professor (retired Air Force) that I was applying to OTS, thinking he would be all proud and excited. He said I needed to seriously reconsider. I have another four years until I hit the maximum age to apply to OTS, so he recommended that I look for more entrepreneurial opportunities to serve my country – and only apply to OTS if I still hadn’t found a way to do that by age 26. It also didn’t help that the Air Force’s top guy on sexual assault prevention got arrested for sexual assault this week. Your talk at Palantir confirmed my misgivings. Given the circumstances, would you discourage someone from entering the Air Force? I will give you the same advice I would give my daughters. Yes, you should join the military and serve for a few years if you are able, either as an officer or enlistee. I would recommend this kind of service to any young American for any one of many reasons. Just to limit the discussion to your career, and whether accepting an offer will benefit your occupational journey, the answer is still yes. The lifelong pride you will feel, and the respect that others have for military veterans, are net pluses for your future. Basic Training alone is an invaluable experience that will enhance your life. It will boost your confidence, your awareness of selfless service and orientation towards the team & mission, and your toughness in negotiating hurdles. No bureaucracy or challenge has ever struck me as troublesome after my half decade on active duty. Are there jerks and toxic leaders in uniform? Yes, but welcome to the real world. Jerks are everywhere in life. My sense is that the ratio of heroes to jerks is much higher in the armed forces — great friends, great commanders, and great subordinates, too. I would not give up my time in the USAF for anything. It’s too bad your recruiter is a dunce. That happens. Unlike you, a lot of people are worried that military service means less compensation, but maybe your recruiter overemphasized that aspect. But he’s right: the compensation is fine & higher than many realize. Unfortunately, military compensation is not very flexible or merit-based, which will chafe after a few years. And yes, the downsides of inflexible military HR are ridiculous, and there is a terrible to randomness to who gets caught up in its dysfunction. The senior ranks at the Pentagon know it and are working on that. Still, even if you get one or two bad assignments, the net positives outweigh the negatives. My advice is to do what you can to serve for the initial 4-5 years in the Air Force, Navy, Army, or Marines … and don’t forget the Coast Guard. If another stint at that 5-year point is appealing, proceed, but you should always be thinking about what’s next (true in all careers). There is no dishonor in serving for the basic 4-year commission, then applying yourself elsewhere. Hope that helps, Kandace. Aim High! Update: changed “write” to “right”. A righter should know this!